I haven’t seen Justice League yet. Of course, I’ll eventually watch Warner Brothers highly-anticipated culmination of their DC Extended Universe where all of their most popular heroes come together. Batman, Wonder Woman, Aquaman, Flash, Cyborg and a freshly resurrected Superman teaming up to save the Earth! How can I miss this, no matter what people are saying about it. Admittedly, I’m not exactly in a rush to see this latest entry of the DCEU. I can wait. I have heard the loud reactions from fans and moviegoers about Justice League. They’re not hard to miss, along with the box office reports of Justice League opening to disappointing numbers. That kind of caught people’s attention. The movie has been getting a lot of attention since its debut. It makes sense. If you’ve been trying really hard to build up a lot hype and anticipation for your movie, then everyone will be watching the final results when it does hit. 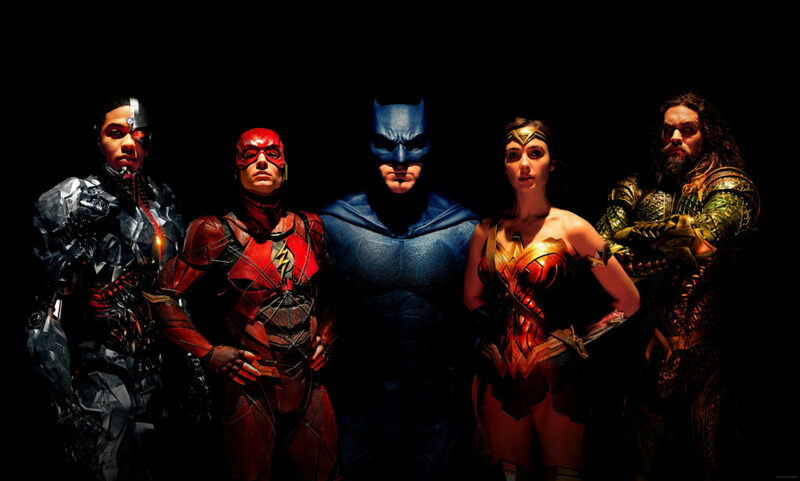 In Justice League’s case, simply and kindly put – it has not been as well received as Warner Brothers had hoped and hasn’t yielded the results it was banking on. But I don’t want to talk about that. Blogs, Youtube videos, message boards and podcasts are burning up with discussions of the fallout of Justice League. Everyone is ready to jump in and play Monday morning quarterback with their thoughts of what went wrong here, why did it happen, who’s to blame and what WB’s next move should be with the DCEU. The answers to all that will come in time. Or maybe they won’t! It would be great to hear exactly what is going on at WB right now as they’re analyzing the weekend gross of $94 million Justice League earned and trying to comprehend how it became the lowest earner out of all their DCEU movies. I bet folks over there have their collars undone, there’s a lot of avoiding eye contact moves and everyone is going to hit a local bar right after work. Warners isn’t alone with their stunned reactions. Superhero fans are being quite vocal about their thoughts about the latest DCEU entry. Loving it, hating it and being casually indifferent towards it. There’s a lot to discuss and theorize about the state of the DCEU at the moment. Justice League is a pretty significant event for superhero fans. No matter how it was going to be received, Justice League was destined to be a flick that we’d be talking about for a long time. Unfortunately, for everyone involved it’s leaning more towards the negative aspects to what happened with it. Years from now fans it might become known as the ‘Justice League Incident’, in much the same way fans refer to Batman and Robin or Josh Trank’s Fantastic Four with unenthused monotone murmers. Rather than actually watching Justice League I have said I would prefer to see a detailed documentary covering everything that has gotten us to this point with it. So much interesting stuff must have went on! Everything that was going behind closed doors at Warners when first planning this big production. The excitement of everyone when it was announced Justice League was coming in two parts! Does anyone remember when this was announced as having a Part One and Part Two? I could have sworn that was said at some point. Or was there just some miscommunication somewhere with that? The DCEU being planned. The 2013 Comic Con announcement of not simply a sequel to Man of Steel, but a battle royale movie between Batman and Superman. Then the sullen face that took place almost three years later when Batman v Superman: Dawn of Justice was panned by almost everyone. The optimism the studio had in director Zack Snyder suddenly being broken. The viral memes of ‘Sad Affleck’ and the Sound of Silence becoming the title song of the DCEU. An invitation is made to reporters and fans to the Justice League set in hopes to reassure them of the movie. Suicide Squad is a big hit in the summer of 2016, but once again gets panned by that pesky Rotten Tomatoes site. Ben Affleck, who was set to direct and star in a solo Batman movie, suddenly pulls out, saying “I cannot do both jobs to the level they require”. Fans are assured he will remain wearing the cowl. 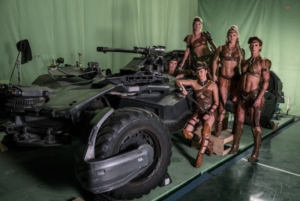 While director Matt Reeves will step behind the camera. Down the road it will be rumored that Reeves isn’t keen on Affleck and wants to recast the Dark Knight for his movie. Wonder Woman is released and is embraced by audiences and critics and becomes a smash. Patty Jenkins’ film gives a shot of encouragement for the DCEU and now Gal Gadot will surely bring added star power to the League. 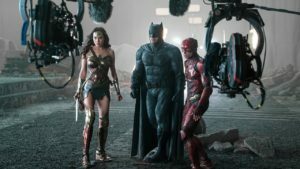 During post-production of Justice League Snyder leaves due to a family tragedy and Mr. Avengers Joss Whedon steps in to complete the film with two months of reshoots. Meanwhile, trailers of the film are starting to look a bit different than the earlier ones audiences saw. 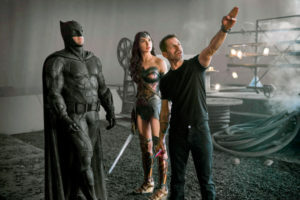 Warner’s edict that the runtime of Justice League must be kept to under two hours compounds problems of cutting the film down. It would also later anger Snyder fans as his version of the film would be exorcised. An online petition for Warners to release Snyder’s version of Justice League is born. Currently it has over 70,000 signatures from fans. Whether it compels the studio to release a different cut of Justice League is unknown right now. 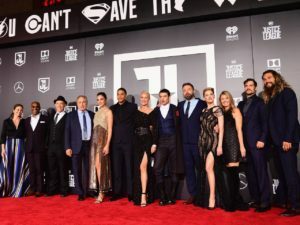 The turbulent production finds itself in an added absurd problem with Henry Cavill and his Mission: Impossible 6 mustache that must be digitally removed for his reshot scenes. Danny Elfman replaces Junkie XL to compose a score and some reports I read state Elfman had never actually watched the film! Not sure if that’s been confirmed, but amazing! Finally, the film comes out and….well we know where we’re at now. The Rotten Tomatoes site holds back it’s rating for the film (at the time of the reveal it was at 43%) prompting conspiracy theories by fans. Oh and let me add the budget for Justice League is said to be in the $300 million range, making it one of the most expensive movies ever! Then you have Whedon who doesn’t get a directing credit. Snyder saying he still has not yet seen the finished movie. It makes you ask – well who exactly made this movie? Was it just a WB production! Then there were the accusations of past sexual misconduct towards Affleck during the height of publicity for the film. Odd tweeting behavior by Whedon favoriting tweets criticizing the villain Steppenwolf. Plus, there’s other reports I read where CGI artists claim they are still trying to finish effect shots for the film for unknown reasons. Perhaps for an extended DVD, but they’re not definitely sure! This is all fascinating! And this is just stuff I have read about, I can only imagine what else must have occurred that hasn’t come out yet! It sounded like such a chaotic production with so many mounting problems. I’m kind of amazed they made the release date having anything to hit screens! Justice League’s story is not done yet. We still don’t know what the total repercussions it will have on the future of the DCEU or anyone involved in the production. Time will tell on that. There’s a fan documentary being attempted about George Miller’s aborted 2009 Justice League film. I think this 2017 film would be just as interesting a project to cover. It all just sounds like a maddening chaotic time crunch of trying to implement changes on a film that had already been preordained. It’s like trying to repair a broken race car in the middle of a race. It’s sounding like it’s one of those movie where the behind the scenes drama is more engrossing than the film itself. I would love to hear what the principals involved honestly have to say about this and hear their take of what happened. I’m sure most wouldn’t or can’t discuss any of that now. They’re probably bound by life and death contracts to not say anything negative about what occurred. So they’ll all continue to put as positive faces as possible on the production and the film as they can. Maybe in ten or twenty years we’ll get a clearer picture of just what went on during all this and hear some revealing and honest perspectives. But just the story of the production sounds more compelling, exciting and humorous a story than the actual Justice League film itself. I hope someone starts planning an extensive project about the story of the Justice League film. While I’m waiting for that, I’ll try to actually go see the movie. 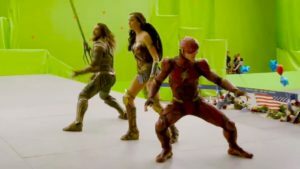 So, have you heard any interesting behind-the-scene anecdotes or anything that took place regarding Justice League that could be added to a future documentary about the making of it?